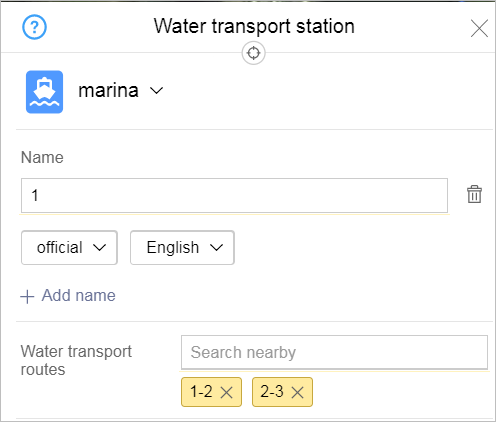 Water transport items include sections of water transport lines, stations, and routes. The attribute Name of the item is assigned in accordance with the general rules. See 3.1.3. Map item naming rules. Enter the number or name of the route that makes stops at that station. 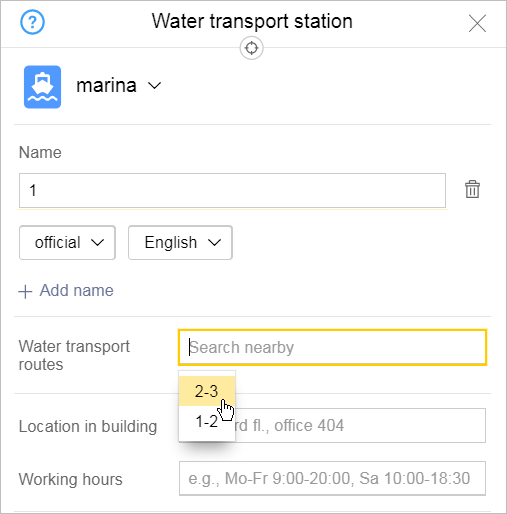 For the rules for selecting water transport routes that are applied to the People’s Map and the rules for creating and attributing them, see 3.16.2.3. Rules for creating water transport routes and adding attributes to them. If the route number you need is not in the list, enter it in the line (this creates a new route). The address is specified in accordance with the rules for adding attributes to address locations (see Section 3.5.2. Rules for adding attributes to addresses). 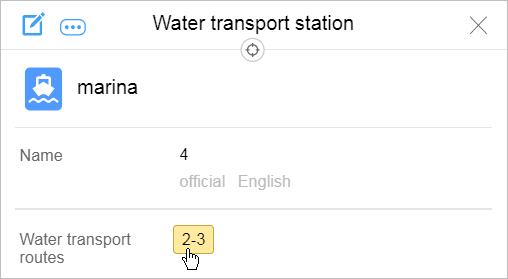 You must enter the water transport station's email address in the “Email address” field. 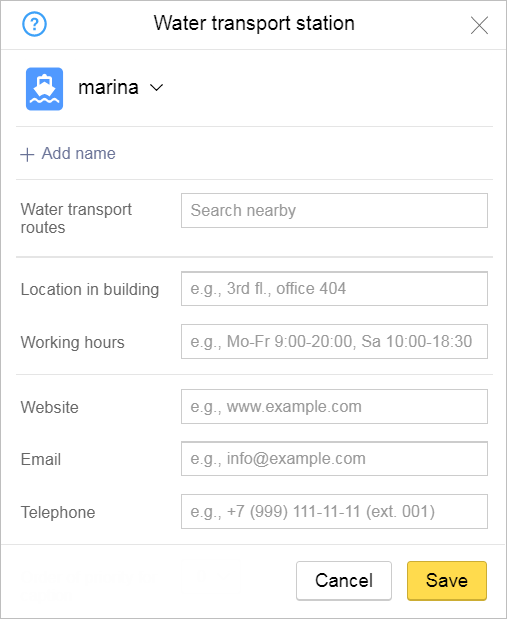 You must enter the water transport station's phone number in the “Telephone” field. The method of creating water transport routes is described above. See Cl. 3.16.2.2.3. Water transport routes. 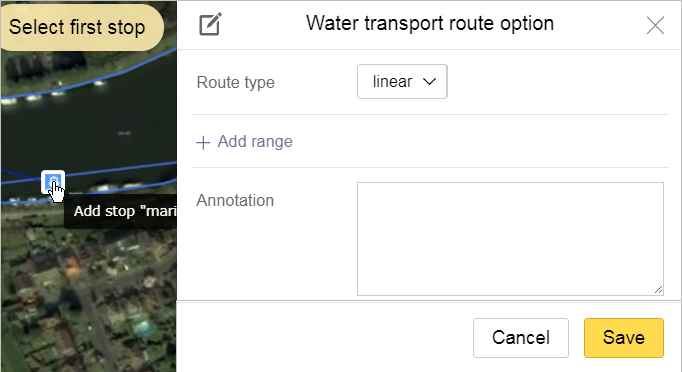 Draw regular water transport routes that travel in urban and suburban waters on the map. Other existing water transport routes that carry passengers on a regular basis. After a route is created, you should link it to the water transport stations where the vessel stops (going in order in both directions). Be sure to include stations where passengers only embark or only disembark). Do not include stations where the vessel passes by but does not stop. The panel will switch to editing mode and then you can edit the route name. Stations that are already included in the route will be marked .